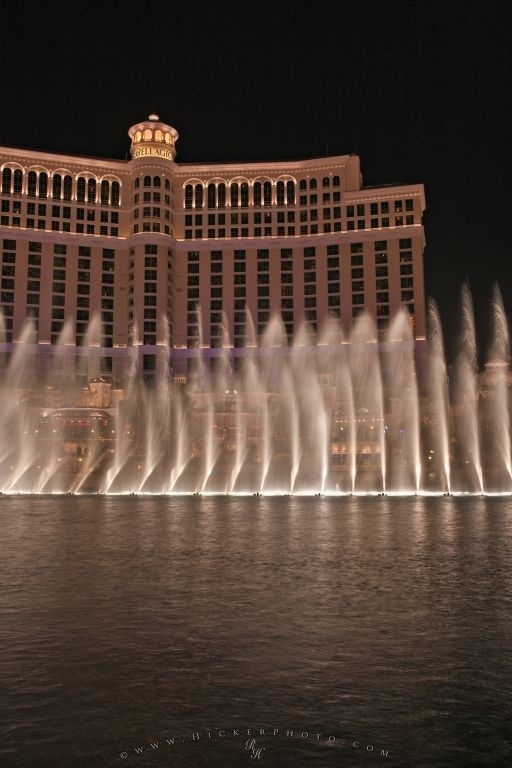 As captivating at night as it is during the day, the graceful water show featured on the 8 acre lake in front of the Bellagio Hotel and Casino, is definitely an eye-catcher along the Strip in Las Vegas. Streams of water gracefully twist and turn, tower high then low, as they're carried on the sounds of orchestrated music. This is the famous water show at the Bellagio Hotel and Casino in Las Vegas. At night the dancing water is lit up and contrasts against the dark water of the lake. Bellagio Hotel and Casino, Las Vegas.